This gourmet pack has some of the best premium products from Ecuador. 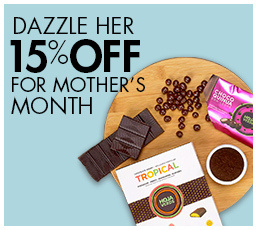 It includes 1 grounded coffee from Loja, 2 fine dark chocolates of different cocoa content, 1 box of bonbons filled with ganache of fresh tropical fruits and herbs, and 2 packs of quinoa pops covered with milk and dark chocolate. Premium Coffee from the south lands of Ecuador. This coffee is very consistent and has great character. It has a defined acidity, medium sweetness and a delicate aroma, which makes it very easy to drink. • Origin: Loja (Ecuador) - Gonzanamá, Quilanga and Cariamanga. • Altitude: 5600 a 6600 feet. • Varieties: Typica, Caturra, Bourbon y Catimor. These delicious chocolates are made with premium organic cocoa beans grown in the tropical lowlands of Ecuador, the most biodiverse country on earth. Ecuadorian cocoa has long been recognized as the world’s finest bean. Its ‘Arriba’ variety brings an unequalled depth in aroma and flavor. These luscious Hoja Verde chocolates are made with the world's finest cocoa beans from Ecuador and stuffed with delicious ganache of fresh passion fruit, mint, mandarin and guava. The quinoa seeds have been a staple of the Latin American diet for centuries. Today, quinoa seeds are regarded as 'super foods'. A daily consumption of these seeds is recommended due to their high protein and dietary-fiber contents. These unique quinoa pops are covered with the finest dark and milk chocolate from the tropical lowlands of Ecuador.